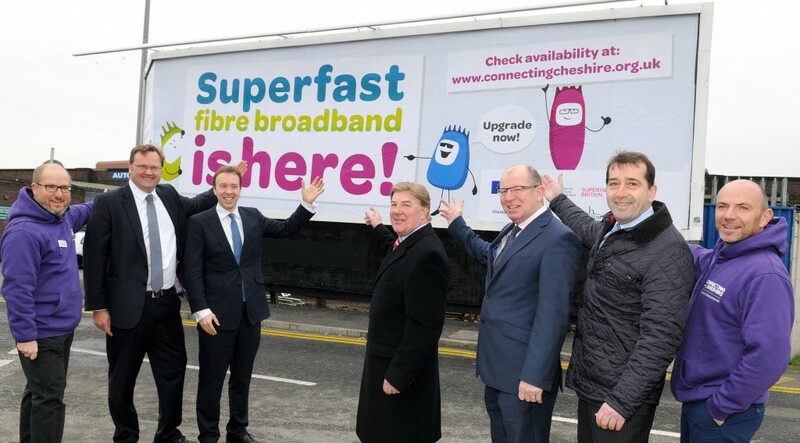 13 February 2015 – Government Minister for Business and Enterprise Matthew Hancock has visited Cheshire to celebrate the county’s progress in helping superfast broadband reach a key milestone of two million premises nationally. High speed fibre broadband is now available to 55,000 premises, including more than 20,000 businesses, across the county under the Connecting Cheshire partnership, set up to boost the availability of this advanced technology outside of commercial roll-out areas. Connecting Cheshire has funding from the Government’s Broadband Delivery UK (BDUK) programme, as well as four councils – Cheshire West and Chester, Cheshire East, Halton and Warrington – and BT, with additional funding from the EU. The £28.5m project will provide fibre broadband to more than 80,000 homes and businesses by the end of 2015. This builds on commercial investments so that 96 percent of Cheshire – more than 400,000 premises – will have access to speeds of up to 80Mbps in total. Councillor Stuart Parker, Cheshire West and Chester Council’s Executive Member for Culture and Economy, said: “Superfast broadband is already making a big impact in West Cheshire. Bill Murphy, BT’s managing director for next generation access, said: “Today marks a giant step forward in the rollout of fibre broadband across the UK. Working in partnership with the four Cheshire councils, we have been able to reach into the heart of communities that have so far been beyond the reach of this vital technology. “Already, we can see the impact that fibre is having with the Government’s estimate of more than 56,000 jobs created as a result of this rollout by 2024 and rural economies benefiting by around £9m every day due to the work being done now. As part of the roll-out of fibre broadband Connecting Cheshire has run a Superfast Business support programme. Based in Chester, Operational Command Training Organisation (OCTO) is one of 600 businesses across Cheshire to have benefited from the programme. OCTO provides leadership and crisis management of challenging situations for a wide range of clients including government departments and large corporations across many sectors. Cheshire residents and businesses can check availability of fibre broadband by visiting the website www.connectingcheshire.org.uk If it is available, they need to contact their internet service provider, shop around for the best deal for them and order an upgrade to fibre broadband. The network, being built by more than 100 planners and engineers at Openreach, BT’s local network business, is open to all communications providers on an equal basis. Currently, more than 140 communications providers offer fibre broadband services over BT’s network. This will enable the people of Cheshire to choose the provider and broadband package that best suits their needs. Around 875 miles of fibre-optic cable will be laid and more than 400 new roadside cabinets installed as a result of the project. Pictured with the Connecting Cheshire Fibre Guys billboard are L-R: Andrew Arditti – Connecting Cheshire; Stephen Mosley – MP Chester; Matthew Hancock MP – Minister of State for Business and Enterprise; Cllr Stuart Parker – Cheshire West and Chester Council; Kieran Charleson – BT Partnership Director; Mark Hart – OCTO and Steve Travers – BT.